I haven’t posted much in the last month what with being busy at work, the World Cup occupying much of my time and the warm summer weather not being favourable for sitting at a computer screen. So blogging has taken a bit of a back-seat, but I have been reading quite a bit. One of the books I read recently was Frederick Brown’s book on the belle epoque era in French history, For the Soul of France, which has the subtitle Culture Wars in the Age of Dreyfus. That book covers significant events such as the rise and fall of General Boulanger, the crash of the Union Générale, the Panama Scandal and of course the Dreyfus Affair as well as others. The Dreyfus Affair becomes more fascinating the more I read of it and Brown’s book was especially useful as it helped put the events into context. I would recommend the book for anyone who would like an introduction to the period. Frederick Brown has also written a book covering the 1914-1940 period called The Embrace of Unreason, a huge biography of Zola that I have yet to read and a biography of Flaubert which I have started to read. As I was reading For the Soul of France I spotted The Disappearance of Émile Zola by Michael Rosen in my local library and so I felt it would be a good idea to follow the Brown book with this one. It covers Zola’s period of exile in England during the Dreyfus Affair. I had previously read Ernest Vizetelly’s With Zola in England: A Story of Exile which is a great first-hand account of events by Zola’s English publisher and was published in 1899 while the Dreyfus Affair was still raging. Michael Rosen is able to add to that account by referring to Zola’s correspondence and more recent works on Zola. On the evening of Monday, 18 July 1898, Émile Zola disappeared. Zola had been convicted for criminal libel following the publication in January 1898 of his explosive article J’accuse. In this article Zola claimed that Dreyfus had been falsely convicted of espionage by the army, that evidence had been fabricated and kept secret from the defence, that the guilty person, Major Esterhazy, was protected by the army and that Dreyfus was convicted because of anti-Semitism in the army. All of this was true but that did not stop Zola from being prosecuted. Zola had hoped that his trial would result in a re-trial of Dreyfus but this failed as the military and judiciary closed ranks. Zola faced a year in prison but was persuaded by his lawyer to flee to England instead. As we read this book we discover that Zola had a hard time in England. His home affairs were complicated as he shared his life with his wife of nearly thirty years, Alexandrine, and his mistress, Jeanne, with whom he had two children, Denise and Jacques. Zola could speak very little English and now, although a famous author, he found himself alone and in a foreign land having to hide away in damp, cramped houses and having to cope with English weather and food. He wasn’t totally alone of course as Vizetelly and others were there to help him find a place to stay and to direct his correspondence back home. Zola managed to stay hidden away despite attempts by the press to track him down. Amusingly Zola was spotted almost straight away by some French actresses on tour in London but luckily this didn’t get leaked to the press and he managed to remain hidden away for the whole period. Once he’d moved out of London both Alexandrine and Jeanne were able to visit Zola during this period, albeit at separate times. As he became more settled he was able to enjoy his new passions of cycling and photography and included in this book are several of Zola’s photographs of England and of his visiting family. Rosen’s book also includes many extracts from Zola’s correspondence with Alexandrine, Jeanne and his children. These letters help us to understand his unorthodox homelife and how he tried to please everyone. Alexandrine must have found the situation very difficult but she and Zola were still in love and she continued to adminster his affairs in Paris. Zola’s letters to Alexandrine and Jeanne show that he cared for them both. 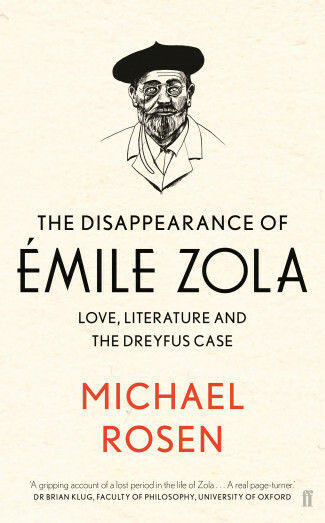 This is a very interesting book for the Zola enthusiast and even if you’ve read Vizetelly’s book you will find it fascinating to read. It also includes the short story that Zola wrote whilst in England called Angeline or The Haunted House which is a sort of ‘non-ghost story’ and the text of J’accuse is reproduced in full. I suppose the only criticism is that the Dreyfus Affair is only explained very briefly so it would be best to read up beforehand on the scandal that instigated the events laid out in this book. This was cross-posted on The Intermittencies of the Mind. This entry was posted in Jonathan (Intermittencies of the Mind), Non-fiction and tagged Émile Zola, Frederick Brown, Michael Rosen. Thanks for your informative book. It’s got me reading about Zola again. This sounds like a great read. Thanks for the heads-up, Jonathan. I hope you can find time to read it, Dagny. I think you’ll enjoy it. Rosen also talks about the translation of Fruitfulness – it sounds like it suffered the same fate as the other Vizetelly translations.